Regardless of the type of business that you are in, pressure-washing services can generate a good stream of revenue. The key is in knowing what type of services to offer and having the right equipment to do a good job. In addition to your gas or electric powered cleaning unit, pressure washer accessories and pressure washer attachments are a necessity. Once you get started, you can find a multitude of things to clean. Many companies provide standalone pressure washing services, but complimentary businesses can benefit too. House painters, handymen, contractors, and gardeners are just some of the industries that could develop this as an ancillary service. Many successful organizations use this business model to improve their bottom line. Even if your primary job is pressure washing, don't just clean houses or driveways. Diversification is good for everyone. Invest in pressure washer accessories that will help you increase your revenue stream. Include roofs, driveways, sidewalks, public recreation areas, and vehicles. If there is a demand in your area, offer graffiti removal. Think creatively to come up with profitable strategies. There is a plethora of different products available on the market. Make sure that whatever you buy will work with your unit. Ensure that pressure output ratings and the rate of water flow are compatible. The three most helpful categories are wands, scrubbers, and large surface cleaning attachments. Wands - Telescoping wands with belt attachments are great pressure washer accessories for cleaning tall objects. They can extend up to 20 feet in height. The main drawback is that holding the wand up exerts tremendous pressure on the shoulders and back. It can be exhausting. The belt attachment is useful in preventing this. It assists in distributing the weight of the wand so that you won't tire so quickly. A gutter cleaner is another type of nozzle that lets you clean debris in a snap. Its unique hook shape fits over the top of the gutter. Leaves and dirt are blasted away without requiring you to become a contortionist. Scrubbers are rotary pressure washer accessories that are excellent for cleaning smaller flat surfaces, such as walls. The circular action will remove set in stains and hard to clean substances. The head of the nozzle is actually turned by the force of the water coming through it, so you don't have to worry about it malfunctioning. Large pressure washer surface cleaners are for large flat expanses. 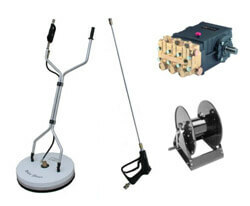 Also called a whirl-away, these pressure washer accessories makes quick work of big projects. The large plate shaped head conceals a series of rotary water jets. They are designed to disperse the pressurized cleaning action over an extensive area. Not only do pressure washer accessories make the job easier, but also several times faster. This means that if you plan well, you may be able to book more business in a single day. Labor costs are significantly reduced, while output and efficiency increase. The standard lance and wand ensemble can present challenges in certain situations. Adding pressure washer accessories can greatly extend the overall range of the machine, offering you more ways to earn money. No ladder! Gives you extra hight to reach difficult areas. Learn about safety and what is crucial to know before pressure washing.